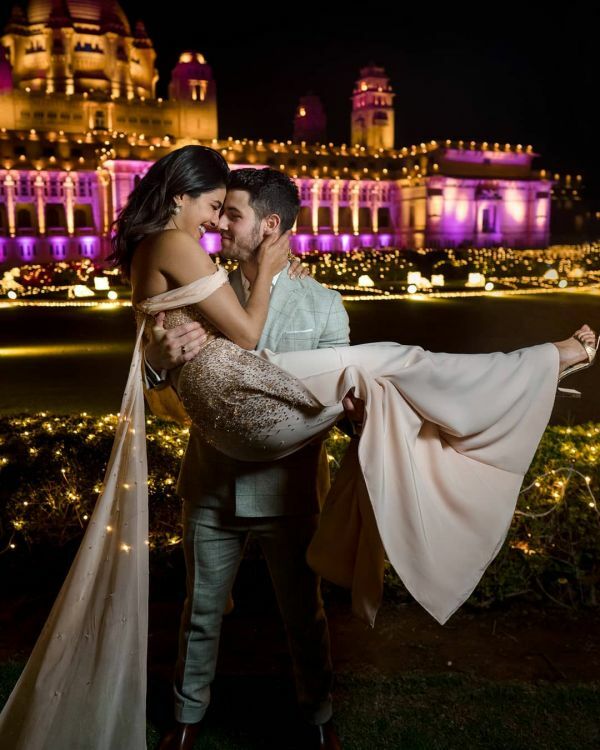 Priyanka Chopra Steals The Show (Again!) And We Want To Steal Her Look for NYE 2018! 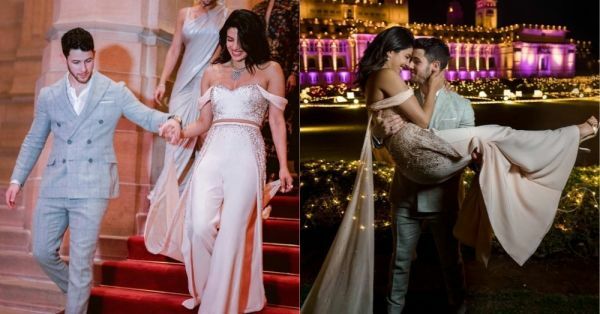 PeeCee's fairytale wedding was the stuff dreams are made of, and while we were still reeling from how gorgeous she looked, she dropped another sartorial bomb that has us lusting, and frisking, for that perfect NYE outfit. But, let's come back to our Indian royalty, Priyanka Chopra who dazzles like a star in this delicately embellished number. The fitted bustier is intricately scattered with sequins and beads in a symmetrical design, lending just the right amount of sparkle. We absolutely love how the drop sleeves merge into a generous fabric train to really amp up the glamour. Balanced perfectly with wide leg, wrap-style pants also lavishly adorned with matching embroidery, the outfit enunciates Priyanka's hourglass figure flawlessly. While bling will always be in - the strategic use of metallic accents is what makes this look such a hit! As dreamy as every outfit looks on PeeCee, it's her accessorising skills that we desire the most! (We hope Mimi Cuttrell, Priyanka's stylist - is listening!) The layered necklaces accentuate the sweetheart neckline of the bustier, without looking garish while the matching diamond-studded drop earrings are barely visible through wisps of hair. Stacked rings from Ilene Joy Jewelry and barely-there gold metallic strappy heels complete the look. A special mention for Nick Jonas for looking dapper as ever and rocking that double-breasted jacket and windowpane check with much finesse! (Sorry girls, can't ignore a well-dressed man). So, having got a healthy dose of fashion inspiration from one of our finest, and with two weeks to 2019, we decided to bring to you our NYE edit so you can shimmy into the New Year looking extra without breaking the bank. Go full glam in Zara's version of understated bling. Pair with chunky gold hoops and over-the-knee boots to stay cosy. Flouncy sleeves, a ruched neck, and delicate embroidery - Princess Jasmine would approve! Paired with wide-leg velvet trousers and eye-catching metallic pumps, this look is a sure winner. This delicate bodysuit with sequins and beads is a head-turner in every way possible. We'd skip the leather mini though and go instead with a pleated midi skirt to play with different textures. Grab your wallets and get shopping - because we're all stars in our own right, and the time to shine is NOW!